WASHINGTON — A startup company with plans to develop orbiting propellant depots will fly an experiment to the International Space Station next month to demonstrate some of its key technologies. 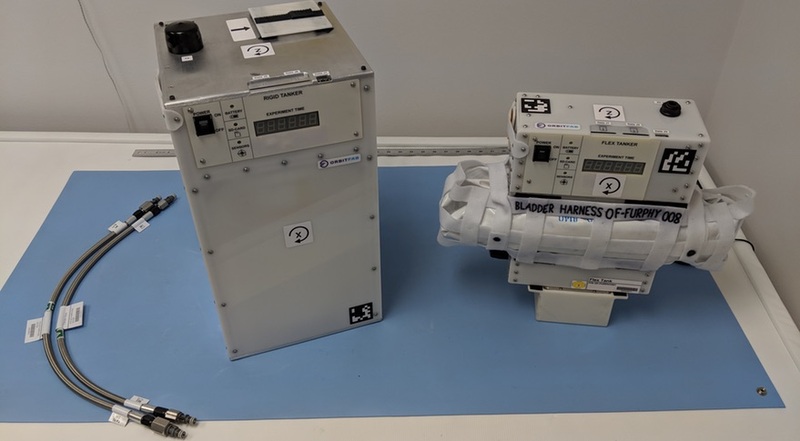 San Francisco-based Orbit Fab is working with the Center for the Advancement of Science in Space, which operates the national lab portion of the ISS, to fly an experiment on the station to test the ability to transfer propellants in microgravity. That experiment is manifested on the next SpaceX Dragon cargo mission, scheduled for launch no earlier than Dec. 4. The experiment involves two cubesat-class “tankers,” one of which will be launched full of water. The tests, conducted inside the station, will explore the ability to transfer water between the two, with the water than transferred to the station’s water supply at the conclusion of the tests. “This is a great opportunity to test our high-reliability fuel transfer technology,” said Daniel Faber, co-founder and chief executive of Orbit Fab, in a statement to SpaceNews. The experiment hardware, recently delivered to NASA for loading onto the Dragon, was developed in just four months. Jeremy Schiel, another co-founder of Orbit Fab, said in an interview that the tests will provide an opportunity to validate key systems, including valves and pumps, and also examine the effects of slosh dynamics in weightlessness. Assuming the launch takes place as scheduled, those tests should be wrapped up by March. Should the tests on the ISS be successful, the next step for Orbit Fab will be to start launching tanks into orbit. That could happen as soon as late next year, Schiel said, with the company lining up prospective users of the tanks, which could support satellite servicing efforts. Orbit Lab announced in August an initial round of funding, led by venture capital firm Bolt. The company didn’t disclose how much it raised. The company sought to get ahead of the market — there’s currently no on-orbit refueling of satellites other than propellant transfers on the ISS itself — to demonstrate to the market it will be ready to support satellite servicing ventures under development.